New Oklahoma defensive coordinator Alex Grinch isn’t exactly a stats geek. But he will, from time to time, rely upon statistics to gauge his defense’s performance. Grinch won’t obsess about total team defense (inarguably, the Sooners do need to rank better than 114th nationally, where they ranked last season), but he will demand certain standards for yards per play. Grinch won’t live or die with scoring defense (OU must improve on its ranking of 101st; the other College Football Playoff teams ranked first, 12th and 13th; obviously it matters), but he will pay attention to points per possession. But meaningful measurements like those are probably a bit down the road for this team. For now, Grinch and his staff are emphasizing one statistic that takes, frankly, a culture change: takeaways. In his time as Mike Leach’s defensive coordinator at Washington State, Grinch emphasized takeaways and it made all the difference in elevating the program to contender status. In 2017, Washington State ranked ninth nationally with 28 takeaways, and the Cougars finished 9-4. In 2016, WSU ranked 38th with 23 takeaways, and went 8-5. In 2015, the Cougars ranked 34th in the country with 24 takeaways, and finished 9-4. Last year, when Grinch was at Ohio State, the Cougars still had 23 takeaways, which ranked 28th nationally, and they went 11-2. The numbers are thus: 24 takeaways equates to nine victories. Mark it down. It’s math, Grinch says. Now pair that formula with Lincoln Riley’s offense. 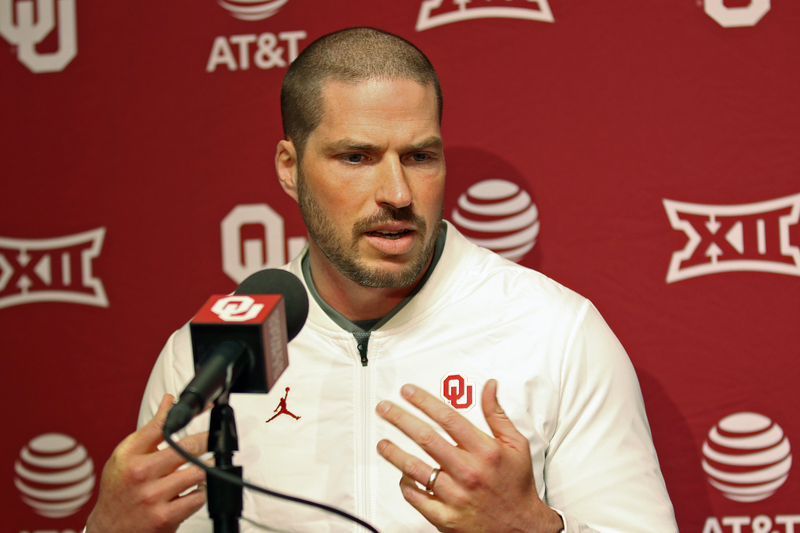 Last week, Grinch was introduced as the Sooners’ new defensive coordinator, and not a moment too soon. In addition to those other historically awful defensive rankings, the 2018 OU football team set a program record for the fewest takeaways in school history with 11. Change was overdue in Norman, and Riley is confident Grinch is the man to implement change. That mentality is simple: get the football. Consider how good the 2018 OU football team could have been if, instead of giving up long touchdown drives, they doubled their takeaways and got Kyler Murray and his offensive mates just one extra possession per game. That’s an almost 14-point swing every week — one less TD for the other team and one more TD for the Sooners. Mathematically, that equates to victories over both Texas (a 3-point loss) and Alabama (an 11-point loss) and, off of that, a berth in the national championship game. Now, it sounds unrealistic at first to ask a defense to double its takeaways. But is it? Certainly not if that number is 11. From 2000-2011 — the year before Mike Stoops returned — Oklahoma’s defense averaged 31 takeaways per year. Since Stoops came back, the Sooners averaged 19 turnovers per year. During that span, OU’s average yearly total defense ranking was 62nd. Four of the last five years and five of Stoops’ seven seasons, the OU defense failed to get 20 takeaways. “Defensively, you want to contain yards. Obviously, you want to limit points,” Grinch said. “But the purpose behind every play in football is for the defense to get the ball back to the offense. Know what else doesn’t know? Or care? Recruiting rankings. That’s exactly the kind of culture change that can push Oklahoma to the next level — and maybe, finally, produce a national championship.